Garlic has been used worldwide for culinary and medicinal purpose for many thousands of years. Its satisfying flavor makes it a perfect addition to any dish. Moreover, garlic is rich in antioxidants and low in calories, offering many health benefits. Though studies are under way to ascertain all the health advantages of garlic, its benefits outweigh its detriments. Include garlic as part of your diet to enjoy the many advantages it offers, unless you have a problem that garlic may affect. Eating garlic regularly can lower your risks for several cardiovascular problems, such as heart attack, high blood pressure, atherosclerosis and other heart diseases, reports the University of Maryland Medical Center. Allicin -- produced when garlic's crushed -- is rich in several sulfur-containing compounds, such as hydrogen sulfide, which can benefit your heart health. Hydrogen sulfide relaxes the blood vessels, helping to lower blood pressure and lessen your risks for heart attack, explains "Natural News." Garlic has a thinning effect on blood, which can help prevent heart attacks and strokes. The anti-cancer properties of garlic may lower your risks for various types of cancer, including gastrointestinal, colon, stomach, esophagus, breast and pancreas. Antibacterial properties of garlic have the ability to block and halt the formation and activation of cancer-causing substances, the National Cancer Institute reports. Additionally, garlic can bolster your immune system, which can help you fight cancer and other diseases, such as colds and flu. Heating garlic may destroy its anticancer properties, the "Journal of Nutrition" states. You may experience gastrointestinal upsets, such as bloating and diarrhea, if you eat garlic in large quantities. Eating garlic together with food can help reduce these side effects. Avoid eating garlic if your gastrointestinal symptoms continue. Other minor side effects that you may experience after eating garlic include bad breath, body odor, loss of appetite, fatigue, muscle aches and allergies such as skin rash. Garlic may interact with several medications, including insulin, antiviral, blood-thinning and anti-inflammatory medicines and some contraceptives. 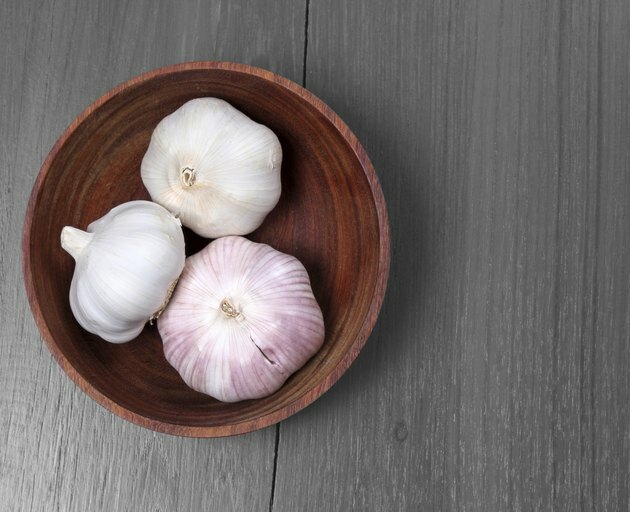 For instance, garlic as a blood thinner can make blood-thinning medications stronger, increasing your chances of bleeding. Consult your physician before you incorporate garlic into your diet, especially if you regularly use any of these medications.